Christie's today said it hopes to sell a working Apple-1 computer for as much as half a million dollars in a special online-only auction that starts next week. The computer, one of less than 50 known to have survived from a limited run of about 200, is even rarer in that it works, according to Christie's, which confirmed an account by the Associated Press that the Apple-1 is functional. Christie's estimated that the rare computer will sell for between $300,000 and $500,000. That's not impossible: Last month, a working Apple-1 sold at a German auction for $542,000. The total, including a 22.3% commission as well as taxes, paid by the buyer was a record $671,400. The May sale eclipsed the previous record of $640,000 for an Apple-1 established last November, also at an auction conducted by Auction Team Breker of Cologne, Germany. Whether the Christie's Apple-1 sets a record or comes close to earlier prices depends on whether the auction attracts the clientele that's been willing to pay premium prices, said Mike Willegal, an Apple-1 expert whose index of existing machines is the world's most complete. "The question is how many people have that deep of pockets," Willegal said in an email Friday. "The last couple of high-dollar Apple-1s went to Korea, so if the publicity gets to Asia, who knows?" Willegal, who keeps tabs on the whereabouts of known Apple-1s, said that the Christie's unit was news to him. "This is likely a new one that has surfaced, which is especially likely if it really has been in this man's hands for so long," said Willegal, referring to the AP story. It said the current owner, identified as Ted Perry, had acquired the Apple-1 in 1979 or 1980, and kept it in a cardboard box since then. Christie's declined to make Perry available for an interview Friday. But Willegal wasn't surprised that the Apple-1 appeared out of nowhere. "I'm sure the high selling prices are going to have some additional units popping out of the woodwork," he said. Apple-1 prices have climbed dramatically since the death of Apple co-founder and former CEO Steve Jobs in 2011. A working Apple-1 sold in November 2010 by Christie's went for $213,000; less than two years later, in June 2012, rival Sotheby's sold a different operational Apple-1 for a then-record $374,500. That kind of money may eventually prompt fraudsters to shill a forgery or an accurate reproduction as the real thing. "I think a reproduction or forgery could be made pretty compelling, but an expert should be able to tell the difference when looking at one in person," said Willegal, who has been approached in the past to authenticate other Apple-1 computers, but has declined because he was asked to do so based only on photographs. Unlike later personal computers, including the 1977 Apple II, the Apple-1 was sold as a fully-assembled circuit board, but minus a case, power supply, keyboard or monitor. Buyers had to provide those components, resulting in some interesting customizations. Christie's Apple-1 is mounted on a wooden board, as are a modern keyboard and the power supply. All Apple-1s were hand-built by Apple co-founder Steve Wozniak in 1976. They sold then for $666.66, equivalent to $2,724 in today's dollars, or more than a top-of-the-line 15-in. MacBook Pro with a Retina-quality display goes for now. 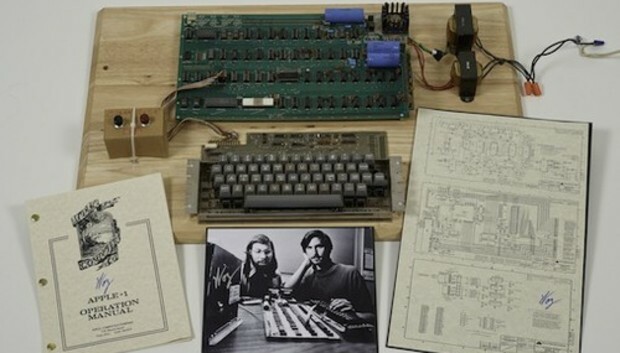 The one to be sold by Christie's is hand-signed by Wozniak, as are the included manual and board schematics. Christie's Apple-1 will be exhibited at the Computer History Museum in Mountain View, Calif., June 24-27. The online auction runs from June 24 to July 9. This article, Another working Apple-1 pops up, could sell for $500K, was originally published at Computerworld.com.